Dolly Parton is having some kind of week. Not only did she get honored as MusiCares Person of the Year on Friday with a star-studded celebration dinner (which included knock-your-diamond-encrusted-socks-off performances), but she got the honoree treatment yet again on Sunday night at the Grammy Awards. The 2019 Grammys tribute to Dolly Parton was certainly a fitting salute to one of country music’s reigning queens. Parton then switched it up, moving to her most recent hit, “Red Shoes,” which fans may know was part of the 2018 Netflix film Dumplin’, starring Jennifer Aniston, with music from Parton herself. The mix of a modern hit with some of her classics was a low-key reminder that Parton has been a fixture in the music scene for the better part of 50 years and has contributed some truly legendary hits to country and pop music alike. Arguably the most fun moment, which ensured that everyone at the Grammys was on their feet and clapping along, was when Parton was at the center of a group of artists who came together to sing “9 to 5.” It was, in a word, iconic. Did we mention that by this point in the performance, we were basically happy-crying and feeling like all was right with the world? Because yeah, that totally happened. 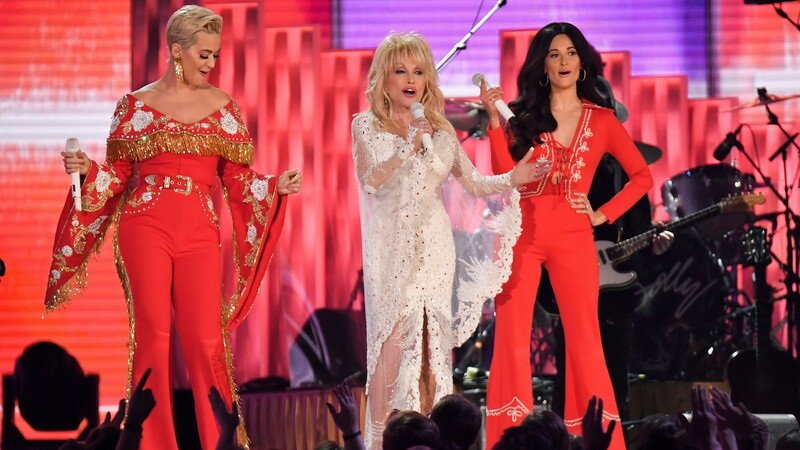 The tribute fans saw on television on Sunday night was a condensed version of the tribute to Parton that happened before the Grammys on Saturday night. As reported by Vulture, a bigger roster of music’s finest, which included Pink, Willie Nelson, Garth Brooks and Trisha Yearwood, all showed up to pay their respects to the queen of country music. We have a feeling that it, like Sunday night’s shorter and sweeter tribute, was the definition of perfect. Parton deserves nothing less.